…Maverick is the name. Ten months ago I wrote about Warner Home Video finally releasing Maverick: The Complete First Season on DVD. I said then that everybody in America should buy it, if only to sell enough to persuade Warner to bring out the later seasons. Well, I don’t know how many Americans bought it, but it was enough to keep ’em coming; Season 2 is now out. It’s hard at this remove to appreciate what a revolutionary breath of fresh air Maverick was when it debuted in the fall of 1957. 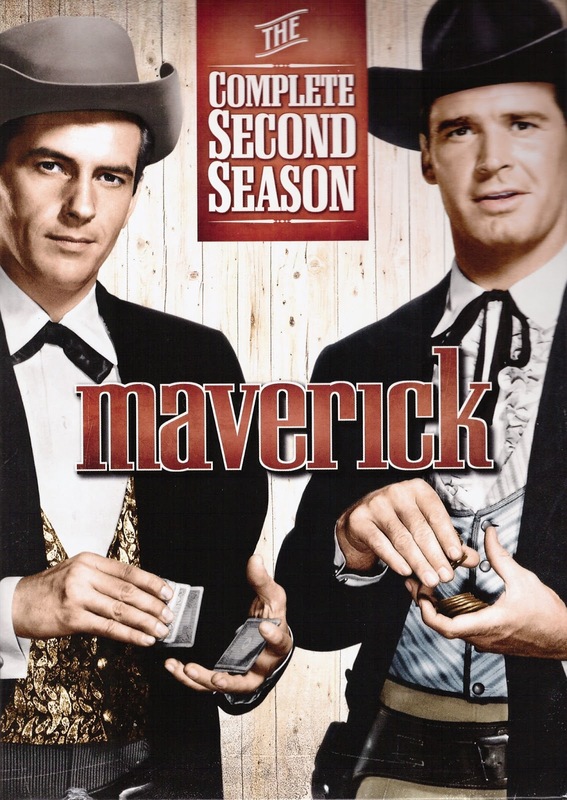 Its main character, Bret Maverick (James Garner), was a professional gambler — as was Bret’s brother Bart (Jack Kelly), introduced halfway through the first season. Before Maverick, gamblers were seldom seen as western heroes; glib, slick and dressed like a dandy, they were more often shown as shady and untrustworthy — when they weren’t outright villains and cheats. Bret and Bart never cheated at cards, but they weren’t above running a con game when they figured somebody had it coming. They weren’t strangers to gunplay, but neither were they trigger-happy or quick on the draw, much preferring to talk (or bluff) their way out of trouble. (“In other words,” scoffs one damsel at Bart, “you’re a coward!” To which Bart wheedles: “Isn’t everybody?”) Viewed today, the brothers look like much more conventional heroes, but only because they skewed the mold — which also has allowed them to age more gracefully than other TV western heroes, the type of characters Stan Freberg once spoofed as “Bang Gunleigh, U.S. Marshal Fields”. Splitting the star billing — Garner featured one week, Kelly the next, with occasional team episodes — was another, more practical innovation. It allowed two production units to shoot simultaneously, which — along with frequent trips to Warner Bros.’ bulging library of stock footage — meant more of the series’ modest budget would appear on the home screen. Other series would employ this method too: Warners’ own 77 Sunset Strip, Hawaiian Eye and Surfside 6; Universal’s The Name of the Game; Bonanza over at Paramount, and so on. Season 2 supports Garner and Kelly with the customary mix of seasoned Hollywood veterans (Lyle Talbot, John Litel, Reginald Owen, Wayne Morris, Marcel Dalio, Neil Hamilton, Barbara Jo “Vera Vague” Allen, Jimmy Lydon, Sig Ruman); guest stars from other Warner Bros. series (Richard Long, Efrem Zimbalist Jr., Robert Conrad, Connie Stevens); and up-and-coming future Oscar winners (Martin Landau, Clint Eastwood, Louise Fletcher). This season also contains three of the best episodes of the entire run — and hence three of the best hour-long TV episodes ever: “Shady Deal at Sunny Acres”, in which Bret vows to get back $15,000 stolen from him by a crooked banker (John Dehner); “Gun-Shy”, a hilarious deadpan spoof of Gunsmoke wherein Bret runs afoul of Marshal Mort Dooley; and “The Rivals”, a clever adaptation of Richard Brinsley Sheridan’s 1775 comedy of manners transferred to the American frontier. Those last two, like many of Maverick‘s best episodes, were written by Marion Hargrove, who rose to fame with his wartime bestseller See Here, Private Hargrove and went on to a long and fruitful career in Hollywood. He also wrote screenplays for The Music Man, Boys’ Night Out, Cash McCall and 40 Pounds of Trouble. The Warner Bros. TV series of the 1950s and early ’60s, along with Universal’s later series in the ’60s and ’70s, were the last flowering of the Hollywood studio system before it unraveled entirely. Cleverly written, fast-paced, sharply edited, and acted by a parade of old and young pros, these episodes of Maverick stand as delightful testimony to why and how Warner Bros. dominated prime-time TV for the better part of a decade. Check Maverick out. Meanwhile, here at Cinedrome, for my next post it’s back to Darby O’Gill and the Little People. It was a unique Western and Garner was fabulous. My favorite episode has to be the perfectly-done GUNSMOKE spoof. Rick, I lean toward "Shady Deal at Sunny Acres" myself, but "Gun-Shy" would have to be a close second. I have never seen this series, but it looks really interesting. Thanks for providing all the background info.